The conflicts between the three great monotheistic religions Christianity, Judaism and Islam are shaping our world more than ever before. 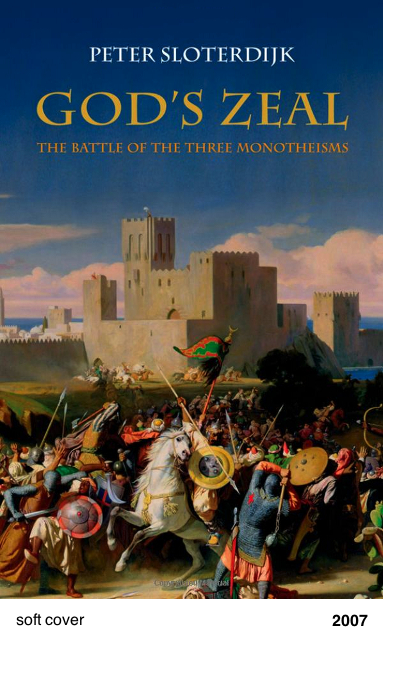 In this important new book Peter Sloterdijk returns to the origins of monotheism in order to shed new light on the conflict of the faiths today. Following the polytheism of the ancient civilizations of the Egyptians, Hittites and Babylonians, Jewish monotheism was born as a theology of protest, as a religion of triumph within defeat. While the religion of the Jews remained limited to their own people, Christianity unfolded its message with proclamations of universal truth. Islam raised this universalism to a new level through a military and political mode of expansion. Sloterdijk examines the forms of conflict that arise between the three monotheisms by analyzing the basic possibilities stemming from anti-Paganism, anti-Judaism, anti-Islamism and anti-Christianism. These possibilities were augmented by internal rifts: a defining influence within Judaism was a separatism with defensive aspects, in Christianity the project of expansion through mission, and in Islam the Holy War.